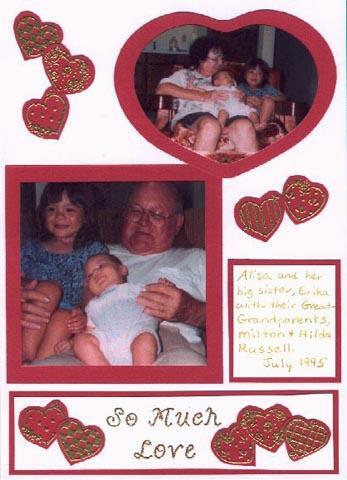 This is the right side of a two page layout called, So Many Grandparents, So Much Love. I used heat embossing for the first time in this layout. The stamps are DOTS and the font for the title is DJ Script Bold from the Dazzle Days cd. I printed out the title and then used my light box to trace it with an embossing pen and embossed it with gold embossing powder to match the embossed heart stamps. I used my coluzzle nested heart template to cut the heart shaped photos and mats.